Product categories of Equestrian Products, we are specialized manufacturers from China, Horse Rugs, Horse Saddle Pads suppliers/factory, wholesale high-quality products of Horse Bandage R & D and manufacturing, we have the perfect after-sales service and technical support. Look forward to your cooperation! Horse Riding is popular in Europe, America, Australia and so on. When the owner or trainer participates in competition. Horses will be worn some Equestrian Products to reduce friction between rider and horses` back. 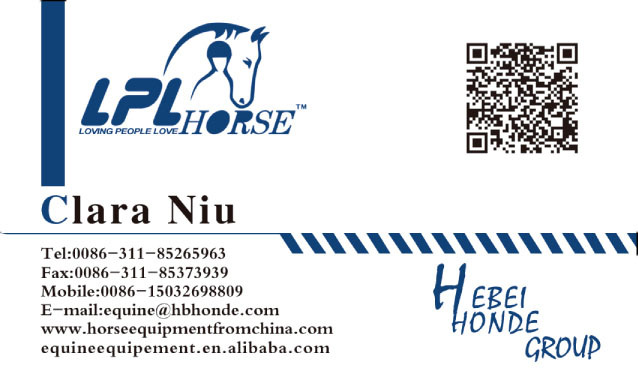 HEBEI HONDE GROUP is special in producing horse rug, horse saddle pad, Horse Fly Mask, Horse Bandage, Horse Halter, Horse Lead Rope, horse brush and other horse grooming kits. In order to expand our business and serve our customers well. We have established company in the United States. Meanwhile, our company have warehouse both in America and France. We support do business with Amazon.You are welcome to contact me to express your requirements.